For her appearance at a recent event, Shraddha picked a pastel Anita Dongre suit to wear. Bindi in place, the actor rounded out her look with jewelry from Pinkcity by Anita Dongre and a pair of matching sandals. For Diwali festivities, Vidya picked an Anita Dongre sari to wear. PinkCity by Anita Dongre jewelry rounded out the actor’s look. Wearing Anita Dongre, Nargis launched her app in Mumbai yesterday. Jewelry from PinkCity by Anita Dongre complemented the dress well. It was a fairly simple look, but effective; Nargis looked nice. 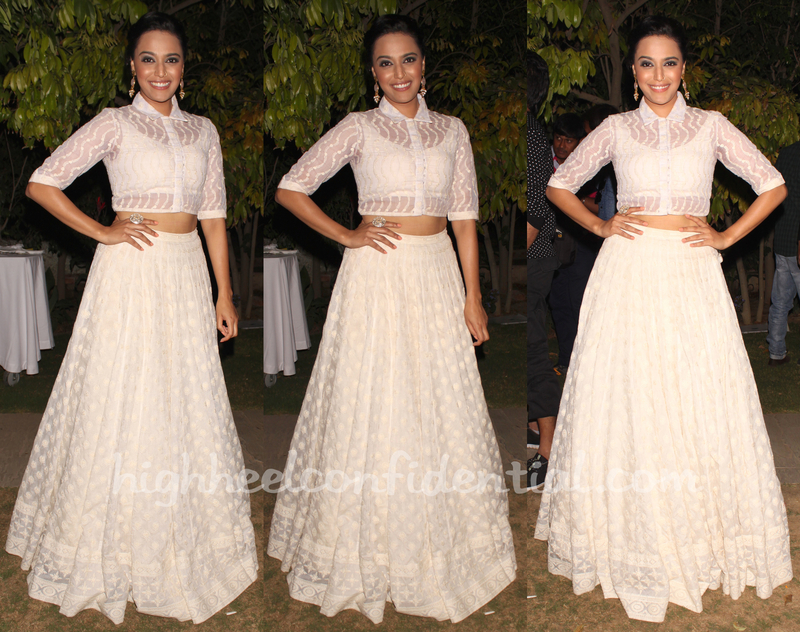 At the unveiling of her upcoming movie’s poster, Swara was photographed in ivory Anita Dongre separates. Wearing her hair up, the actor finished out her look with earrings and ring from Pinkcity by Anita Dongre. She looked lovely! One teeny-tiny snag though… Even though the crop top didn’t look snug by any stretch (ha! ), the visible hook fastenings made it seem otherwise. Considering she looked nice, it didn’t matter looking at the bigger picture, but a valid complaint it still was. Wearing a festive Anita Dongre suit, Sonakshi attended her upcoming movie’s curtain-raiser. A pair of Pinkcity by Anita Dongre earrings and metallic sandals complemented the cheery suit perfectly. She looked great! Check back later for full-lengths. And for now, additional images here.